The choppy recovery in U.S. housing plodded along in April with housing starts dipping 2.6% from their pace in March. New construction remained above pre-recession levels but at less than half of the peak activity in 2006. Single-family houses, which make up about 70% of new residences, outpaced multi-family units, according to the Commerce Department report. Building permits suggested further construction, although their pace dropped off to the slowest rate since November. Housing economists have cited a lack of new homes as a drag on real estate sales. The Federal Reserve reported that industrial production rose 1% in April, more than analysts expected, with manufacturing output registering its strongest gain in more than three years. The auto industry accounted for some of the surge, but so did makers of business equipment. 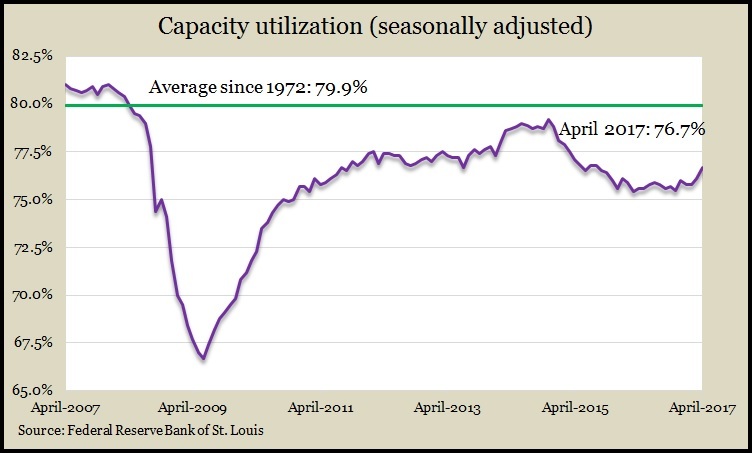 With production also increasing for mining industries and utilities, the capacity utilization rate rose to its highest point since August 2015. Capacity utilization grew to 76.7%, still far enough from the 45-year average of 79.9% to suggest that inflation is not an imminent concern. Household debt finally recovered from the financial crisis, surpassing the level reached during the third quarter of 2008, according to the Federal Reserve Bank of New York. In the first three months of 2017, household debt reached $12.73 trillion, $50 billion above the previous record, led by student loans, mortgages and automobile financing. Credit card balances, which can be an indicator of consumer confidence, actually declined in the most recent quarter. The moving four-week average for initial unemployment claims fell for the first time in three weeks. The Labor Department indicator is 33% below the historical average, which suggests employers continue to be reluctant to let workers go. That helps support a job market that should boost hiring and wages, which could fuel more of the consumer spending that drives economic growth. The Conference Board reported that its index of leading economic indicators rose in April, for the sixth month in a row. The 0.3% gain – following increases of 0.3% in March and 0.5% in February – suggests continued moderate economic growth, the business research group said. Consumer confidence and stock prices led the advance in the index while building permits and factory hours held it back.